I think there was dust on the camera lens. Hence..the spots. Sorry!! 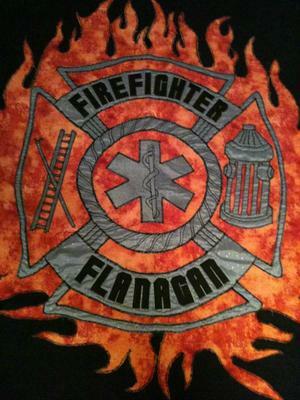 The emblem and fire are done trapunto with all the little details quilted in. The red border has a feather motif all around. The black has simple 2" lines all coming from center of the emblem, with the exception of an 11" "Avante" design in the 4 corners inside the feather border. 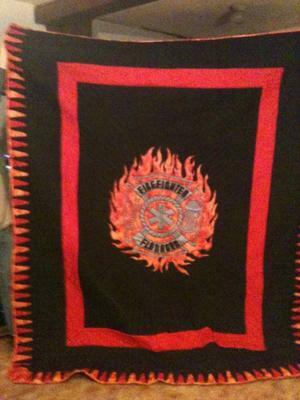 Kaleb put the quilt on the futon in his home office where he has all of his certificates and keepsakes for display. 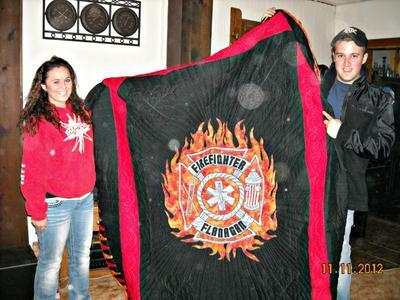 It is special to me that he is proud enough of it to display it to all of his firefighter buddies. Wow - what a gift of love! !